I was off sick from work today and slept most of the day away. When I awoke, I was feeling much better, but was absolutely famished. I considered calling and ordering some take-out chicken soup from Swiss Chalet until I looked up the nutritional value. For one bowl of chicken and vegetable noodle soup was over 1000mg of sodium!! No thank you! My husband suggested that I make my own. The problem with that was that I had no chicken in the fridge! I had veggies and broth and whole wheat egg noodles (no yolk) but no chicken. Can’t have chicken soup without chicken, can we? But by this point, I knew I wanted soup. So I went scouring around the web, looking for ideas. I knew I had about a pound of mushrooms that needed to be used up soon, so I based my searching on that ingredient. 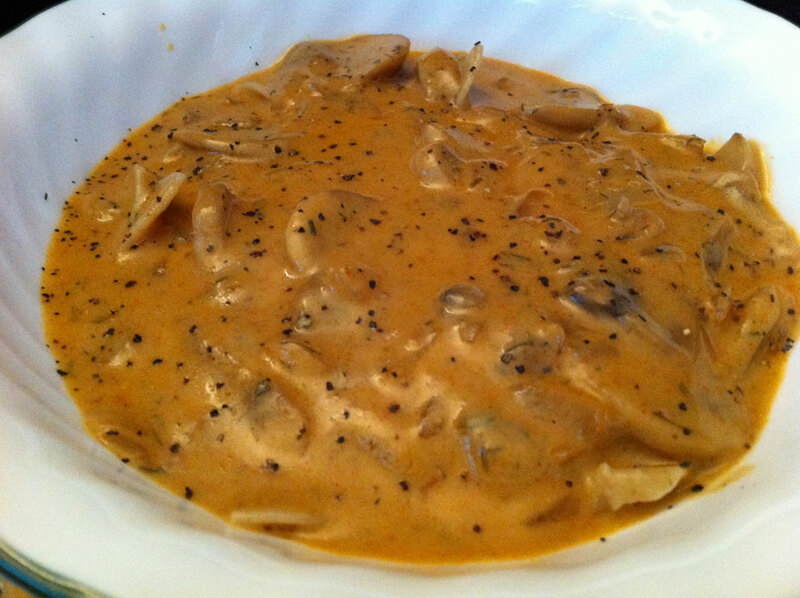 What I found was an intriguing recipe over on AllRecipes.com called Hungarian Mushroom Soup. I was surprised to find out that with the exception of the fresh parsley (I just had dried), I had all of the ingredients. That looks like a lot of substituting and rejigging, but it really isn’t, hence why I’m not including a recipe. Pop over to the original recipe on AllRecipes.com and check it out. This was truly an unexpected pleasure. The soup is flavourful, robust and hearty. I was surprised by how much flavour was in this soup, to be honest. There is a richness and deepness to its taste that is surprising, along with that sourness that I’ve tasted in Hungarian and German food before. The dill was stronger than I expected, but not unpleasantly so. This made a decent sized pot of soup and I’m looking forward to finishing it off through the week. All told, this one is a “keeper” in my books. There aren’t too many ingredients, so it’s likely that you might have all the ingredients on hand, even when the cupboards are getting bare. It won’t break the bank, though, if you have to run out to get everything (primarily broth, onion, sour cream and mushrooms). The whole thing cooks up in one pot on the stove and takes maybe 45 minutes from start to finish, max. This makes for a really quick and easy meal to make, as soups go. The only issue I had with this is that the recipe suggests the batch makes 6 servings. I figured that meant a cup a piece. At a cup a piece, it actually only makes about 5 one-cup servings. If you want to stretch it to 6, you’ll need to limit it to something like 3/4 cup servings and you might squeak out just barely 6 servings. But frankly, I found a 1-cup bowl to be perfect. It’s low in calories, not bad for carbs and the sodium level is more than respectable. Even the fat could be cut back a bit if you reduced the amount of unsalted butter used to saute the onions and mushrooms in, but I think 9 grams isn’t bad at all. Pair this up with a salad or handful of sliced cucumbers & baby tomatoes and a few crackers and you’ve got yourself a really great lunch. This entry was posted in altered recipes, Carb-friendly foods, comfort food, dinner, Lunch, nutritional values, one-pot-wonders, quick meals, quick-and-easy, review, sides, soups, stove-top and tagged black pepper, chicken broth, dill, fat free sour cream, lemon juice, mushrooms, onions, paprika, parsley, reduced sodium, salt, skim milk, sour cream, soy sauce, unsalted butter, whole wheat flour. Bookmark the permalink.